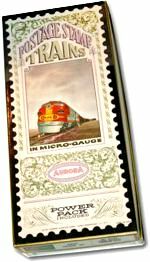 Although they were around for only seven years, give or take, Aurora's Postage Stamp Trains left an indelible mark on the history of N Scale model railroading. Many modelers got their start in the scale with a Postage Stamp set, much the same way as their fathers or grandfathers were introduced to the hobby with Lionel. My lifetime of N Scale model railroading began in 1968 with a Postage Stamp set. Because so little information about the products and their history is available, I decided to correct the problem by publishing everything I've learned over the years for the benefit of collectors, enthusiasts and model railroad historians. With the help of others, this information- and media-rich website continues to grow over time. Almost 600 pages of Postage Stamp goodness await you—please enjoy!